I was hesitant to tackle this French classic for a number of reasons, the main one being it is French. But whilst i was trawling through the numerous recipes for this dish I was comforted by the fact that it can be translated into a 'fish boil' not as elegant, but definitely something that I am not afraid to tackle. From start to finish this dish literally took me 15 minute to make. It is so easy and so tasty and the most surprising thing of all was that it was very filling. Something that is appropriate both for a dinner party and for a quick meal at home. All of the traditional recipes that I found use equal parts olive oil and fish stock, I didn't do this as I just couldn't bare to add a cup of oil, olive or not to this otherwise healthy dish. Approx 8 mussels (I got the NZ mussels that are already cleaned and come in kg packets, the fish monger was more than happy to open a pack and sell me however many i needed. Heat oil in a large saucepan over medium high. Add tomatoes, onion, carrot, saffron, bay leaf and parsley. Crush 1 clove of garlic and add to pan. Cook for 2 minutes. Add all the seafood, lemon juice and salt and pepper and cook on high for 5 minutes. Add the fish stock and wine, bring to a rapid boil and simmer until fish is just cooked (a couple of minutes). it is important that the stock actually comes to a rapid boil. 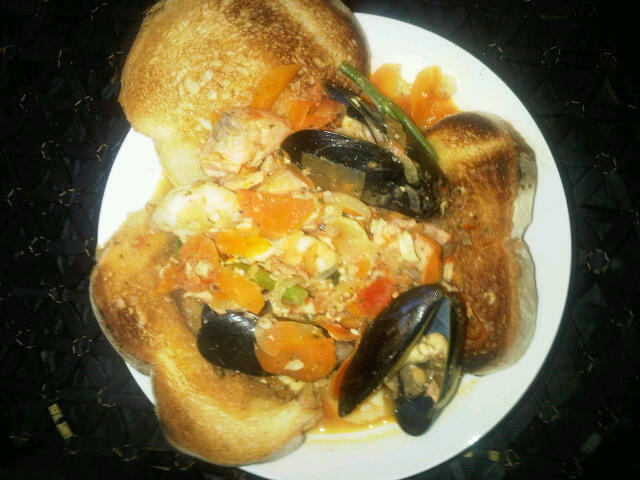 Rub the toasted bread with garlic and serve the bouillabaisse in a bowl over the bread. but how long did yhou spent shopping for all the ingredients? This dish sounds so-so good, I wish I were invited for dinner that night.